One of my favorite kind of cookies are rolo cookies even though I’ve only actually made them once or twice. 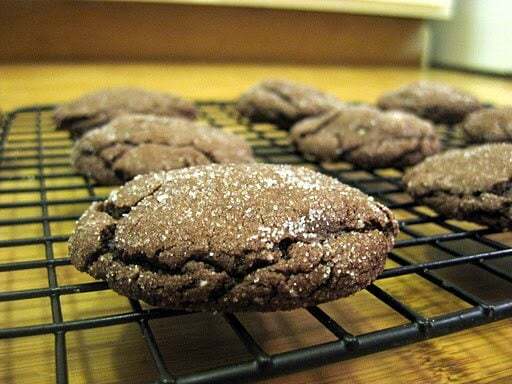 The chocolate cookie is so easy to make but once you take a bite and get a taste of the caramel middle you’ll never want to turn back. I absolutely love rolos, and I’ve bought them a couple more time to try to make these cookies, but they made it into my mouth too quickly to make it into the cookie middle. When a couple of our friends invited us over to a hot chocolate party, they told us to bring a dessert. I asked Nate if I could make rolo cookies, and he said, why don’t we make something Christmasy. So instead we decided upon these cookies, rolo cookies, except not with rolos in the center. Instead the center is a delicious peppermint or mint truffle kiss. And for me, mint is the perfect Christmas flavor. The only thing these cookies were lacking is the peppermint ice cream I wanted to go with them. Yum. 2. Combine cake mix, eggs, vegetable oil in a medium sized mixing bowl. 4. Cover each kiss in a little chocolate cookie dough and roll in a ball. 5. Roll each ball in sugar. 6. Spray a cookie sheet with nonstick spray. 7. Place cookies on cookie sheet. 8. Bake in preheated oven for 9 mins. 9. Cool for a couple of minutes on baking sheet and then move to a wire cooling rack. Enjoy these cookies warm with a glass of cold milk. If you have any left over the next day, microwave for 15 seconds to make the middles gooey again. What is your favorite Christmasy treat? Oh yum! I love how the kiss gets all melty inside. My favorite kiss! Thanks for sharing on Crazy Sweet Tuesday! WHAT?! YUM! Best idea ever! Hello! I just found your blog from over at rolled up pretty! Oh my goodness! These cookies Look Amazing!! mm..mm..mm!! This looks simply divine. I am going to try this. Thank you for sharing!